Learn how to develop an attitude of acceptance towards the present moment. Includes short mindfulness exercises to incorporate into your day-to-day to help you manage stress and feel more at one with yourself. Three calming, spacious and positive guided meditations help you be with what the present moment presents. Includes mindfulness, ‘just being’, breath awareness, self-compassion, relaxation techniques and affirmations. Available in MP3 download only. MP3 download available in 2 formats – Vocal with Music or Vocal Only. 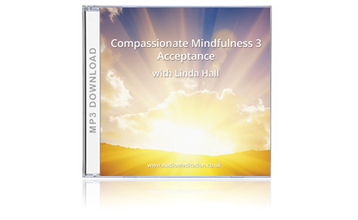 Acceptance is the third in the series – Compassionate Mindfulness: a collection of deeply relaxing guided meditations, combined with simple everyday exercises. Showing how living mindfully and with self-compassion acts as a powerful antidote to modern day stress and supports health and wellbeing generally. This album focuses on how being with the here and now with a greater level of acceptance eases physical and psychological stress and makes it easier to manage life’s challenges. Acceptance shows you how to use your breath, your focus and your attitude to be more accepting of what is happening in the present moment. Each meditation track on this album is followed by a short track suggesting how to easily incorporate what the meditation has taught you into your everyday life. It’s only human nature to resist uncomfortable feelings and sensations, and to use distraction strategies such as constantly being busy, to avoid acknowledging and addressing things that are important in our lives but difficult to manage. However, resisting things takes a lot of energy to maintain, and creates inner tensions that affect our health and well-being. It can build a wall that stops us from moving forward, and may prevent us from feeling integrated, authentic and whole. Learning to accept things as they are in the moment creates a space for profound levels of healing, resolution and a deeper understanding and peace of mind. 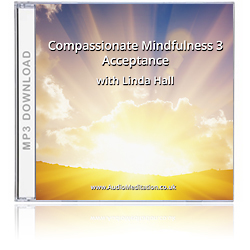 *These meditations are taken from Conscious Process, a twelve-week programme to support health.